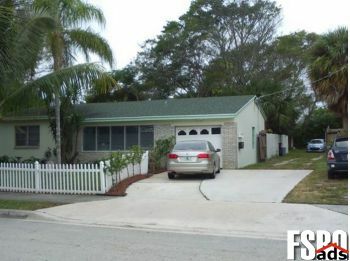 Property has 2 SF homes on it.Only 1 block from intracoastal with 3 waterfront parks. Very special huge property in Historical Northwood Harbor neighborhood of West Palm Beach. Property has 2 SF CBS houses.Check out this rare huge beautiful compound with 3 incredible banyan trees that surround two houses and is fully fenced.Live in one - out the other to help with mortgage. Needs some TLC. Roofs new in 2005. Both houses are rented out for 1,400 and 900. Tenants will move if needed.One is a 211 CBS currently rented for 1,600 a month.Also a CBS 11 cottage is rented for 900 per month.The property is fully fenced with private fenced yards for each house. The cottage has a white picket fence and huge paver patio. A storage shed on back of property. Also lovely Poinsettia trees give great shade and color to the propertyGross Income 2,500 monthly. 29,000. AnnuallyTaxes. 292 monthly. 3,500. AnnuallyInsurance. 250 monthly. 3,000. AnnuallyCity WPB. 275 monthly. 3,300. AnnuallyYard Maintenance. 100 monthly 1,200. AnnuallyNet Income. 1,580 monthly 19,000 AnnuallyOffered for 349,000 OWNER TO VIEW. The huge banyan trees and very private, spacious yard. You can contact the owner directly at: 844-799-7886, ext: 12151. We ensure that buying a West Palm Beach, FL homes for sale is easier than you think. You can find West Palm Beach, FL real estate for sale like single-family homes, apartments, townhouses, condos, land and many others here. If you are looking to buy or sell For Sale By Owner West Palm Beach, Florida, our website can supply you with the most updated West Palm Beach, Florida homes for sale listings information.